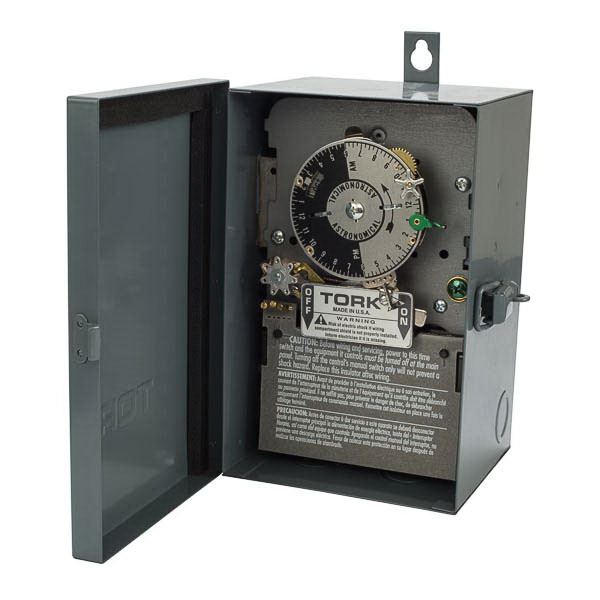 NSI Tork® 7000 Series Mechanical timer switch with skip-a-day, is suitable for lighting, heating, pumps, air conditioning and signs applications. The 3-Pole timer switch accommodates conductor of size 14 to 8-AWG. It measures 5.25-Inch x 4.625-Inch x 8.25-Inch. This screw-mountable mechanical timer switch features metal enclosure. The 24-Hour timer switch with auto ON/OFF action, has 3PST contact configuration. It has a voltage rating of 208 to 277-Volts AC, current rating of 40-Amps and frequency rating of 60-Hz. It features NEMA 3 indoor/outdoor enclosure. This timer switch consumes 3-Watt maximum power. It performs two operations. It has a contact rating of 40-Amps at 120 to 277-Volts AC (general purpose and resistive), 40-Amps at 120-Volts AC (tungsten), 20-Amps at 120 to 277-Volts AC (ballast), 1000 VA at 120 to 277-Volts AC (pilot duty) and 2 hp at 120-Volts AC, 5 hp at 240-Volts AC (motor). The timer switch meets UL 917 and CSA standards.